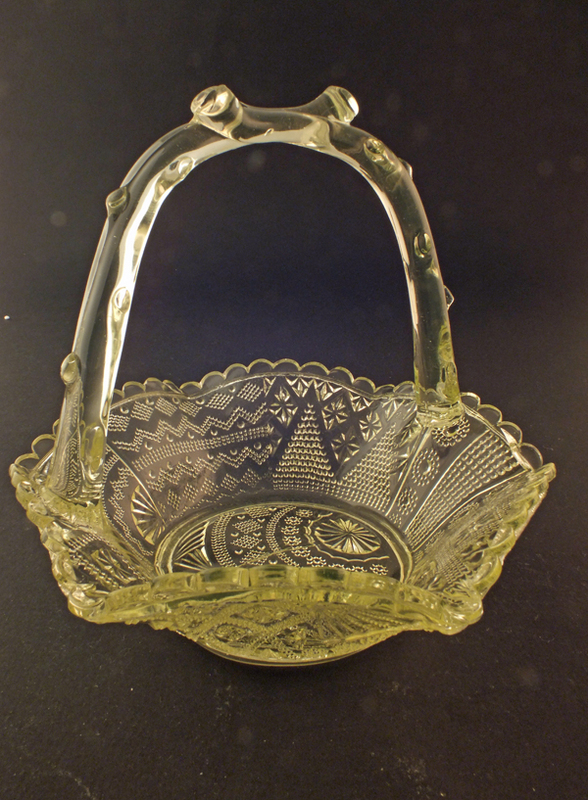 Many manufacturers produced small baskets from pressed glass, presumably used to hold small things such as sweets – “bonbon baskets” as they are often called. Many baskets are not very beautiful but Greener & Co. produced a range I rather like. The pattern is interesting and unusual for vintage pressed glass, being an aesthetic pattern with a Japanese influence and is twinned with a handle with a rustic twig-like design. See the Glass Gallery for more pictures and enlargeable images. 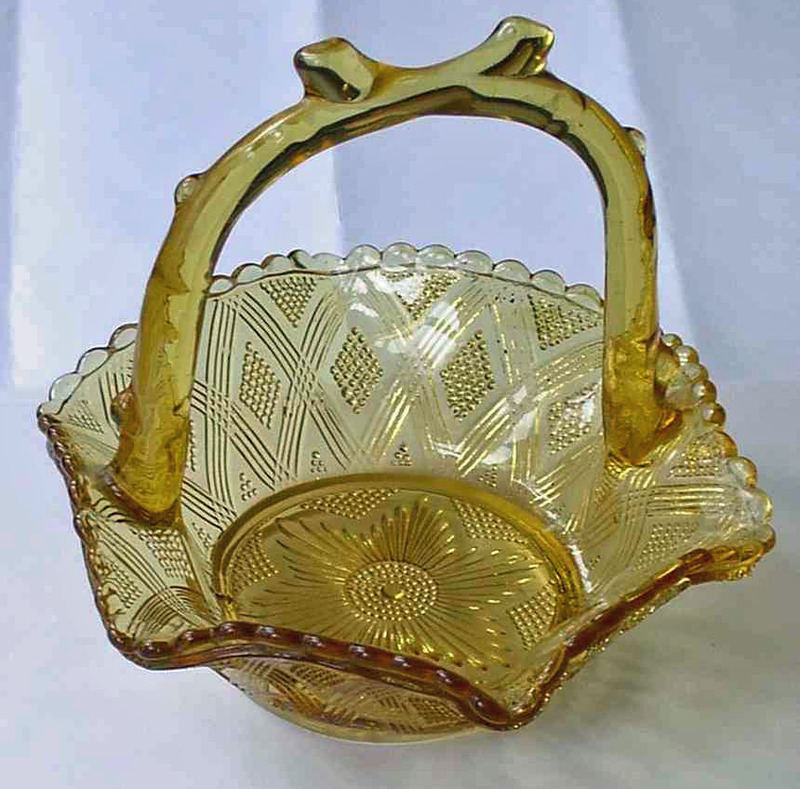 16th March 1888 saw pattern 95935 registered, part of the pattern used in these baskets, a fine imitation cut glass design. 27th March 1888 saw pattern 96775 registered, the twig-like pattern for the handle of the baskets. 21st April 1888 saw pattern 98551 registered, the more Japanese influenced part of the design used in these baskets. The March and April basket patterns are combined in the finished article in a complex and pleasing manner which is difficult to analyse but makes a very nice piece. The individual baskets do show different combinations of the designs but all have the naturalistic branch style handle. These baskets were produced in at least two sizes and several colours, including blue glass, clear glass (flint glass), amber glass, very light amethyst glass and a pale lime green glass. The amber basket is the first pressed glass sale item I ever bought, at an antiques fair in Cambridge. I remember being intrigued by it and thinking that £22 was quite a lot of money for it. However, researching what I had bought led to the registration numbers of which this piece has two. That led to a continuing interest in antique pressed glass which has never waned. This is the article mentioned just above. Weight 467g, feels obviously heavier than the amber glass basket. This is a beautiful piece in a restrained, rather luminous, pale lime green.